A Russian bike with sidecar for a different off road experience. The Ranger has selectable non differential sidecar drive and unrivaled off road ability. Standard features include knobby tires, search light, jerry can, and shovel. There is no chrome and no shine: it blends perfectly with the wilderness. Available in marr green or green and brown camouflage. The Ranger is the number one choice for the adventurous explorer. 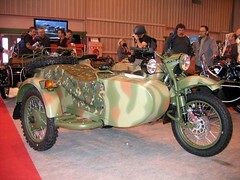 Picture taken at Paris Motorcycle Show 2007 by www.worldwidemotorcycles.com.